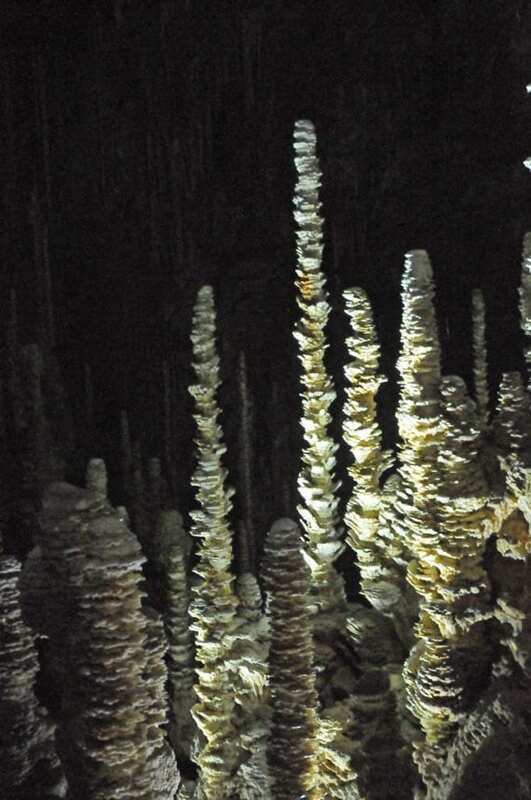 Set in Lozère a French department in the Massif Central the Aven Armand is a big cave described when it was first discovered in 1898 as the most beautiful cave ever seen on earth. It took millions of years for water infiltrations to create drop by drop this incredible fairy tale forest. Its entrance is located on a limestone plateau called “Causse Méjean “ outlined by the deep gorges of several rivers: the Tarn, the Jonte and the Tarnon well known by canyoning lovers. This large plateau and its preserved nature look like an Asian steppe. It actually was the place chosen in 1993 to readjust a few Przewalski horses to live by themselves:11 horses from European zoos returned to wild life and they liked it so much that they quickly multiplied allowing 22 of them to be reintroduced into the National park of Khar Us Nuur in Western Mongolia in 2004 and 2005. The entrance to the cave looks like a small crater 10 to 15 meters wide extended by a 75 meters long pipe. These “holes” are not uncommon in this area and they used to be feared by local people who believed they were direct routes to hell swallowing flocks of sheep and herds of cows as well as human beings! This is the way used by Edouard Alfred Martel, Louis Armand and their team when they discovered the Aven in 1898. E.A. Martel was a very special man born in 1859 who is now considered like the founder of modern speleology. Although he worked as a lawyer he devoted all his free time to travelling and potholing and went all over the world visiting and listing 230 caves and 250 km of underground galleries in Belgium, Dalmatia, Bosnia-Herzegovina, Greece… He went to Great Britain in 1895 where he discovered the underground Marble Arch Lake in Northern Ireland and later he was the first man to go down the 110 meters deep Gaping Gill cave in Yorkshire. In 1996 he explored the largest underground lake of the time in Majorca. In the USA he took part in the discovery of the connection between the Mammoth Cave and the Flint Ridge Cave in Kentucky. Russian people still consider him as the “Father” of their underground researches since he wrote the first description of the Trans-Caucasian caves. Nowadays dozens of caves and clubs of caving still bear the name of this amazing man. Louis Armand was born in Lozère in 1854 and worked as a blacksmith until he met E.A. Martel in 1890 and soon discovered a passion for the underground world. They worked together for 20 years and in 1898 Armand was the first one to go down the “Aven Armand” which bears his name. Can you imagine him going down a 100 meters long shaft in almost complete darkness hanging on a rope ladder? Caving is still dangerous today but in those days it needed determined and courageous men to explore these unknown world and Martel often endangered his own life to save his companions’ life. Fortunately you won’t have to go the same way to visit the “Aven Armand”. It was open to the public in 1927 and in order to make it easier to go down to the cave at 112 meters under ground a tunnel was drilled through the limestone plateau and since 1960 a funicular takes the visitors to the cave in only two minutes. Once there, get ready to be amazed: the cave is huge, 120 m long, 60 m wide and 45m high. A whole cathedral could stand in it. You will sometimes feel like being in an underwater world with long seaweed or jellyfishes. Going along the 450 m long way through this petrified -forest you might see a rabbit or an elephant or whatever your unbelieving eyes will show you. A brand new light show has been set earlier this year using 3D video mapping making the cave looking even more beautiful and fantastical. By discovering this ‘aven’ Martel and Armand obviously gave us a wonderful gift and a great opportunity to better understand our old planet! « Malta Diary: Bar brawl over St Patrick’s Day!